Negril is the ultimate play ground for those looking for adventure and fun in Jamaica. You have one of the longest resort beach in the Caribbean where thousand of visitors frolic each year round. Negril beach is 7 miles long and sit within a sheltered bay. The beach was one of the first adult resort location in Jamaica and home of Hedonism II Hotel, famous for it's nudist resort. Margaritavile restaurant and bar is also located along this stretch of the beach, where you will find a lot of beach goer's relaxing, eating, drinking and enjoying the entertainment. Ricks Cafe in the West End along Negril Cliffs is the place to be from early evening to watch the sunset. You will be able to take in the wonderful atmosphere or watch the more adventurous dive off the cliff into the sea below. For those looking for a bit more relaxing holiday you can while away your time relaxing on the beach soaking up the sun rays , with a Jamaican cocktail. Or you can take a leisure glass bottom boat cruise. Just off the shore of Negril 7 miles long beach is a two miles coral reef, which is protected. This one of the main snorkelling site and where we take you on your glass bottom trip. 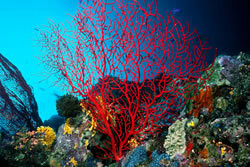 The coral reef here offer some of the best reef life with plenty of fish and bright color corals. The reef is too far out for you to swim and will require a boat trip. Some of the newer reef growth can be found on the outside of the reef. While you cruise around the reef you will see other hotel guest snorkelling at the reef and some shallow water scuba divers. You can put your camera up against the window in the bottom of the boat and take some snaps of the marine life as we move along the reef. Your guide will point out some of the more popular species of fish and corals along your journey. Sometime your guide will go in the water and feed the fish with an urchin under the boat. You will be able to see school of fishes close up as they come to feed. Our boat come with a full crew who have years of experience and will look after you throughout you trip. The boat also comes with your own personal guide who will be your source of information on the trip and will help you get some great pictures to remind you of your trip. We can also provide refreshment and light snack onboard for you at your request. 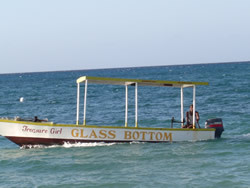 We offer pickup and drop off for our Glass Bottom Boat trips from the following Negril hotels and villas. We also pickup from other holiday properties not listed here, just ask when you make your enquiry.